We’d love your help. Let us know what’s wrong with this preview of Everyday Enlightenment by Gyalwang Drukpa. An engaging and practical guide to finding hapiness today, written by one of the most influential Buddhist leaders in the world. 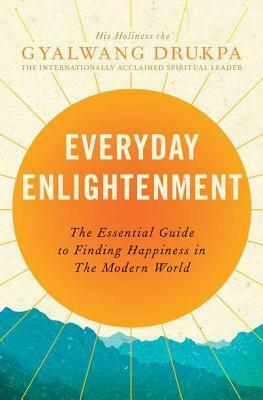 “I love the modern world; we have so many opportunities to be generous and inspire each other,” writes His Holiness the Gyalwang Drukpa in Everyday Enlightenment. And in this simple, powerful book based on ancient Buddhist teachings but framed to An engaging and practical guide to finding hapiness today, written by one of the most influential Buddhist leaders in the world. “I love the modern world; we have so many opportunities to be generous and inspire each other,” writes His Holi­ness the Gyalwang Drukpa in Everyday Enlightenment. And in this simple, powerful book based on ancient Bud­dhist teachings but framed to be relevant in today’s world, the Drukpa outlines ways for all to find that generosity and inspiration in themselves. As head of the thousand-year-old Drukpa Order, the Drukpa uses Buddhist practices to aid people who feel lost or uncertain, or who want to slow the pace of life and attend to the world around them more thoughtfully. He divides the book into sections including “The Un­common Path,” “Walking Your Path,” and “Overcom­ing Obstacles Along Your Way,” and delineates ways in which readers can absorb into their lives Buddhist teach­ings that will allow them to choose to live more fully. To ask other readers questions about Everyday Enlightenment, please sign up. Found this amongst my flatmate's books and decided to go for it. At fist, I was very critical. It was clear that the co-author infused the prose with lots of New-Age sounding references to the "inner child" and "inner self". It seemed like a distorted, westernized rendition of Dharma which had lost its essence somewhere on the way to making more sales. The randomly scattered inspirational quotes in bold font didn't do much to improve that impression, either. His Holiness the Gyalwang Drukpa, has hereby successfully attempted to display most of the fundamental teachings of the Buddha in this very masterpiece of his—Everyday Enlightenment. He brings upon many disciplines from Buddhist literature while he applies them to circumstances which put a halt to the true causes of turmoil in human beings’ lives. His Holiness has thoroughly and concisely combed through many notions of life’s problematic events as per those faced daily by human beings. There are His Holiness the Gyalwang Drukpa, has hereby successfully attempted to display most of the fundamental teachings of the Buddha in this very masterpiece of his—Everyday Enlightenment. He brings upon many disciplines from Buddhist literature while he applies them to circumstances which put a halt to the true causes of turmoil in human beings’ lives. His Holiness has thoroughly and concisely combed through many notions of life’s problematic events as per those faced daily by human beings. There are many elements of truth and particles of spiritual knowledge which are well presented by this spiritual leader in order to deal with such matters. Gyalwang Drukpa instructs mere basic principles which are of great relevance to us, humans. These are spiritual evidence which handle happiness, harmony, and peace of mind, compassion, self-growth, motivation and spiritual enlightenment in the lives of man. His Holiness the Gyalwang Drukpa is very cautiously emphasizing on the happiness which comes from within ourselves versus external influences that lead to personal satisfaction. Gyalwang Drukpa carefully portrays a holistic approach to the idea of seeking for the Buddha within, the spiritual friend within, and, the teacher within. His Holiness gives solutions which restore states of unrest in the daily lives of humans: common sources of nuisances to the lives of humans are well depicted and solutions to such matters are clearly indicated in his book. Gyalwang Drukpa attaches a firm relationship to what the developed mind is really about. He gives many likable amazing examples on how compassion is truly created in the lives of humans. Also, he indicates that the latter should adopt such a characteristic for the sake of enhancing life’s minute treasures and wonders by using the spiritual principles taught by the Buddha. Gyalwang Drukpa indicates that fear, ego, anger, anguish and the feeling of being controlled by others always impact on either man’s peace of mind or on his state of tranquility. I work in a high stress, high stake environment and this was the perfect book to refresh my outlook. It was an easy ready with subtle and profound insight. H.H. the Gyalwang Drukpa knows exactly how to appeal to a western modern audience. He makes Buddhism relevant to office workers, students, and commuters without having to ordain and shave your head. I loved the wisdom contained in these pages. Not the most eloquently written book, but Everyday Enlightenment definitely condenses valuable lessons and Buddhist ideas into an easily understood and relatable way. It's so inspiring! Simple, beautiful book of life in more love, caring and mindfulness. The Gyalwang Drukpa is the honorific title of the head of the Drukpa Lineage, one of the independent Sarma (new) schools of Vajrayana Buddhism. This lineage of reincarnated masters started from Tsangpa Gyare, the first Gyalwang Drukpa and founder of the school. The 12th Gyalwang Drukpa, Jigme Pema Wangchen, is the current lineage holder.